Invenergy’s renewable energy manager, Dan Litchfield, shows a single solar panel outside of the company’s office in Cobb, Wis., on Dec. 18, 2018. These panels would become part of a 3,500-acre solar project, one of the largest solar farms on cropland in the nation. 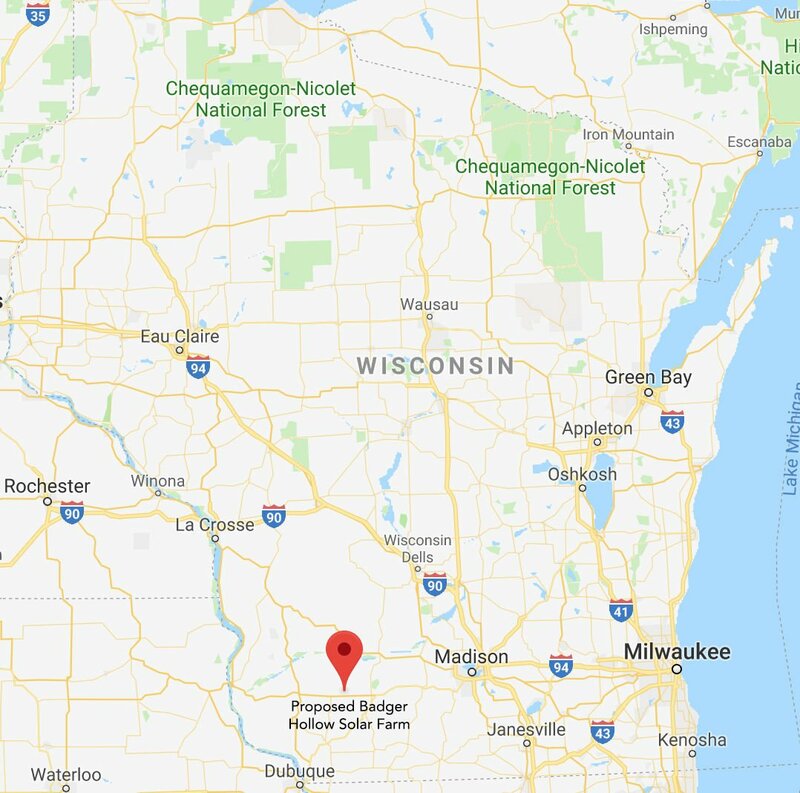 Invenergy’s proposed solar project is comprised of a checkerboard of parcels located between the towns of Cobb and Montfort, in Iowa County, Wisconsin. Alan Jewell looks out across his farmland near Dodgeville, Wis., on Dec. 18, 2018. Jewell has family land next to a proposed solar farm. “This is an ugly, ugly mark on the land,” Jewell says about the proposed 1.2 million solar panels that would be installed. Invenergy's renewable energy manager, Dan Litchfield, shows the patches of farmland that would be turned into the Badger Hollow Solar Farm at the company’s office in Cobb, Wis., on Dec. 18, 2018. The panels would become part of a 3,500-acre installation in Iowa County if the project is approved. It would be one of the largest solar farms on cropland in the nation. Wisconsin Public Service Corp. and Madison Gas & Electric plan to purchase interestsequivalent to half of the plant’s generating capacity. Public utilities cannot easily build such a project themselves. State law requires them to show a need for such development, whereas private companies are not obligated to meet this standard.